I’ve been letting the season premiere of Battlestar Galactica sink in before posting about it, but I have had a bit of fun commenting over on Brad Templeton’s Battlestar Blog and Kenneth Hynek’s post Sometimes a Great. . .Ellen? about the Fifth Cylon reveal. I’ll recount here what I’ve said there and also add in a few new thoughts. This post contains spoilers, so if you haven’t watched the “Sometimes a Great Notion” episode, be warned. I wasnâ€™t a huge fan of Ellen in Seasons 1 and 2; the vampy, flirting Ellen, and the inept political strategist Ellen just werenâ€™t that compelling to me. But on New Caprica, Ellen became much more interesting, and I think Kate Vernon really stepped up and delivered some amazing work in her scenes with Cavil and especially in her death scene. The thought of more Ellen scenes, especially if they involve Cavil and the superlative Michael Hogan as Tigh — that sounds good to me. I may revisit those episodes on New Caprica now since Ryan saw such a change in Ellen’s character, but the “vampy, flirting Ellen, and the inept political strategist Ellen” are pretty much stuck in my head right now. Logically, revealing Ellen as the Fifth Cylon makes a lot of sense, much more sense than my favorite Dualla, but I shied away from the Ellen idea because I just don’t care what happens to her. So she’s the Fifth, so what? I never understood why she did the things she did. She just sort of randomly made everyone’s lives miserable. Now I know why, but she never stuck with me for that reason. I like the idea of star-crossed lovers meeting over and over across time and space. That is compelling. It will be very disappointing if at the end Moore just says â€œAnd then God(s) made it all happen.â€ I like the metaphor and the mytho-religious/religio-magical aspects of the show, but I prefer Science Fiction that takes the Arthur C. Clarke approach, for instance â€“- if we forget how science works then we think “magic is indistinguishable from science.” Thatâ€™s how Iâ€™ve interpreted BSG, that there is indeed a rational, scientific explanation for all these things and civilization has simply forgotten what that is. I think this plays well with the â€œthis has all happened before and will happen againâ€ theme. However, it remains to be seen how or if Moore will connect the dots. When Ellen tells Saul that â€œeverything is in placeâ€ for them â€œto be reborn,â€ this canâ€™t be the first time theyâ€™ve resurrected, and if it is then the Five existed in a near immortal state for a looonnng time prior to that moment. The destruction of â€œEarthâ€ happened 2,000 years prior to what is currently happening in the show -â€“ simultaneous with the exodus from Kobol, if I understand the timeline correctly. Which means that the Temple of Five was built 2,000 years prior to the destruction of â€œEarth.â€ The Final Five have at least been around for 2,000 years before “Earth” was destroyed. Moore confirms with Ryan that the planet’s destruction and the exodus from Kobol happened simultaneously. What if the resurrection hub that Ellen vaguely refers to was on Kobol and it’s their rebirth that breaks up the paradise between the Lords and the Colonial humans? So, the Final Five are half-human, half-Cylon maybe? If you watch the interview Vernon starts to say “half” and then stops herself and says “hybrids.” When asked if Six was modeled after Ellen, Vernon replied “no,” but did mention that when they morphed their faces together they did find bone structure similarities between the two actresses and played that up. If the remains on the planet are Cylon, then where did the Colonial humans come from? The Colonials believe that “Life here began out there,” on Kobol. What if the Kobolians were an advanced race of some sort who endeavored to create human life, but disagreed about the details? The â€œone whose name cannot be spokenâ€ wanted to create Cylon-type beings and the rest of the Lords wanted to create Colonial human-type beings. The Five were the first creations of The One. The One created his Thirteenth Tribe and took them to “Earth,” and the rest of the Lords created Colonial-humans and lived with them in peace on Kobol. What if the Five switched sides after building the Temple? Alternately, what if the Five were sent as spies to the Twelve colonies? What if the virus in the beacon was genetic warfare by the Kobolians to destroy the Thirteenth Tribe? What if the Five seeded the Colonial humans with the knowledge to create Centurion-model Cylons, ensuring the design would be similar to what The One had created on â€œEarth.â€ If The One is the Jealous God, then he would be trying to convert all of the Kobolian creations over to worship him. At what point did the Five return to â€œEarth,â€ since we know they were there when it was destroyed? Or were there once â€œmany copiesâ€ of the Five? RYAN: Tigh and Baltar are offering this theory that the Cylons are the 13th tribe and they found this planet and they called it Earth. Are we to read that as a theory or as fact? MOORE: I think you can read that as fact. RYAN: That planet is Earth? Weâ€™re not going to find out, â€œOh, thereâ€™s this other Earth over here…â€ This is the only Earth weâ€™ll see? MOORE: They have found Earth. This is the Earth that the 13th Colony discovered, they christened it Earth. They found Earth. 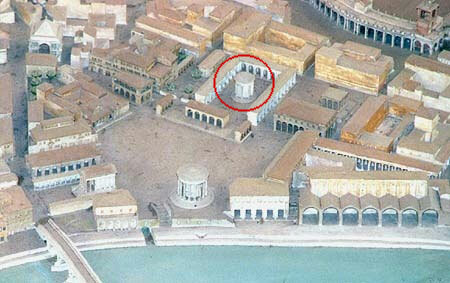 Left, model of the Roman Forum Boarium showing the possible location of the Temple of Mater Matuta. Via the Battlestar Galactica Forum. These words seem carefully chosen to me. We haven’t seen anything that even resembles Earth — no recognizable continents, no moon, the ruins don’t look like anything on Earth, and we’ve been told that the constellations “match up,” but that could apply to several locations. The Colonials supposedly found the ruins of the Temple of Aurora, but the only Temple of Aurora ever on Earth was in the Roman Forum Boarium to Mater Matuta/Aurora/Eos. (Read this thread on the Battlestar Galactica Forum for more information on the Roman Forum Boarium.) It will be disappointing if the whole series turns out to be in another reality or in some kind of simulation. …A womanâ€™s black hair, her dark eyes looking out at him. Could it be Sharon? No. Before we can recognize her, she turns away from the shattered opening. Tyrol walks along an apartment wall. Catches sight of a WOMANâ€™S dark hair in the doorway. A glimpse of her almond eyes. She turns away. He steps up his pace. The Cycles of Time are connected. I prefer they be connected by some kind of technological development rather than mystical. If humans/Cylons have been resurrecting for eons it would be logical for some of each Cycle’s knowledge be saved somehow. I just keep thinking about Ellen’s words to Tigh at the end of “Sometimes a Great Notion” that “all is in place.” If they knew the end of the world was coming and created some kind of resurrection hub, you can bet they also would have stored at least some of their civilization’s knowledge. Shakespeare and Dylan would certainly have been included. Maybe there have been so many cycles that the information is corrupted or the media of storage is organic and therefore accessing it is not just as simple as finding a file on your hard drive. There also seems to be confusion over the timeframe of the Thirteenth Tribe’s exodus. If all of the dates are correct, I suppose it could be explained by three waves of exodus. The first wave, 4,000 years before the Fall of the Twelve Colonies, had to have happened though in order for the location of Earth to be recorded at the Temple of Five. 4,000 B.F. Lords of Kobol and The One create Cylon-humans and Colonial-humans. 3,600 B.F.Â Pythian Prophecy recorded. 3,000 B.F. Lionâ€™s Head nebula beacon and virus created. 2,000 B.F. â€œEarthâ€ destroyed; Final Five upload/resurrect. Exodus of the 12/13 Tribes from Kobol (Lords of Kobol go where?). 62 B.F. Toaster Cylons Rebel/First Cylon War begins/Articles of Colonization signed. 50 B.F. Graystone creates Zoe-R (skinjob) with technology stolen from Tomas Vergis. Year 1 Fall of the Twelve Colonies/Second Cylon War.